Zagreb is really amazing! When someone asks us what to see in Zagreb, it’s really hard to give a simple answer as there is so much. Be aware that this would be a pretty long list if we didn’t stop at some point. As usually visitors of Zagreb stay in the centre of the city, we have collected the most important things you should see during your visit. If you plan to stay longer (not just over the weekend) don’t hesitate to contact us to give you more tips on what to see in Zagreb. You can also get a local RunZagreb tour guide. 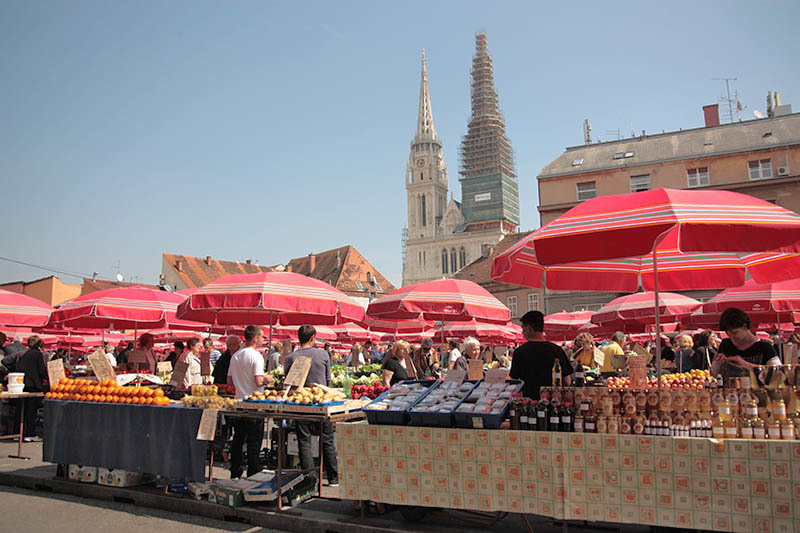 Also called the Belly of the city, Dolac market is main city market in Croatia. It’s open-air market, but also it has a closed space below. Meet a place where locals buy food. Fresh groceries are delivered daily by farmers from Zagreb surroundings, but also from places and cities with far away distance from Zagreb. Fresh fish is also daily brought from our Adriatic sea. Market is full with life and colour. You can taste a lot of products and decide at the spot if you want to buy it. For an examle, you’ll love homemade cornbread which you can only find at the market’s dairy section. Dolac market nurtures it’s 80+ years old tradition as Zagreb’s main market. There is a fish market, butcheries, healthy food stands, fresh pasta vendors, bakeries, cheesemongers, flowers, souvenirs, fruit and vegetables. The market operates mainly in the morning. Although the official working hours are up until 3 PM, the safest time to visit is until 1 PM. The 13th century St Mark’s Church is one of Zagreb’s most emblematic buildings. 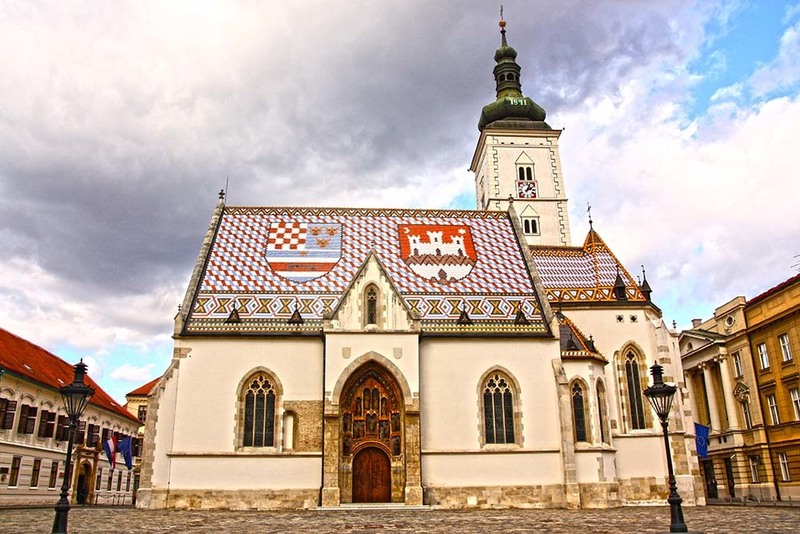 Its colourful tiled roof, constructed in 1880, has the medieval coat of arms of Croatia, Dalmatia and Slavonia on the left side, and the emblem of Zagreb on the right. From late April to October there’s a guard-changing ceremony outside the church every Saturday and Sunday at noon. It’s a fortified tower in Zagreb, in an old part of town called Gradec or Gornji grad (Upper Town). The tower, which dates back to 13th century, was built to guard the southern gate of the Gradec town wall. The name is derived from Latin campana latrunculorum, meaning “thieves’ bell”, referring to a bell hung in the tower to signal the closing of the town gates. If in Zagreb you hear the blast of cannon fire, it simply means it’s noon. According to legend, a cannon shot from the Lotrščak tower soared over the river Sava and landed in the Turks’ encampment, right on a platter of chicken that was being carried to the Pasha for his lunch. The Pasha decided against attacking a city of fearsome sharpshooters so Zagreb escaped invasion. Since this was fired at noon, a cannon has been fired at that time from the same tower ever since. St. Catherine’s Church is a baroque church located in Upper Town which was built by Jesuits in the 17th century. Beside the church originally there was the monastery, today Klovicevi yard. After two fires in 17th century, in which church was burned down, was again supplied by Croatian nobles who in return set their own family coat of arms, or were given the honor of being buried in the church. This is the most monumental sacral building in Neo-Gothic style southeast of the Alps, tallest building in all of Croatia. Its organ is among top ten organs in the world. Once you get to Kaptol square you will see it is dominated by Zagreb cathedral which has been there since 11th century. During the 17th century, fire damaged the cathedral several times, but every next reconstruction enriched its interior with valuable inventory. 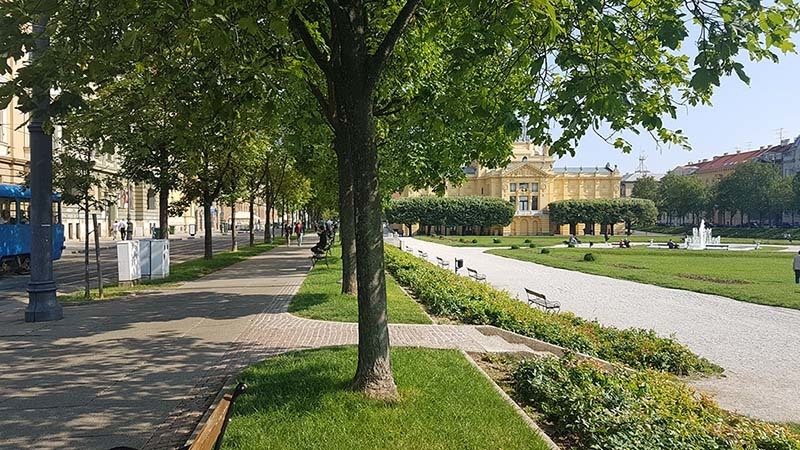 Strossmayer promenade is the best place for panoramic view of Zagreb. One of the most romantic promenades in Zagreb, also known as Zagreb Stross. Throughout most of the year promenade hosts concerts, events and performances. There you’ll enjoy spectacular views of Zagreb. It runs along the remains of Zagreb’s medieval defensive walls. Strossmayer promenade is beautifully green, filled with chestnut trees. 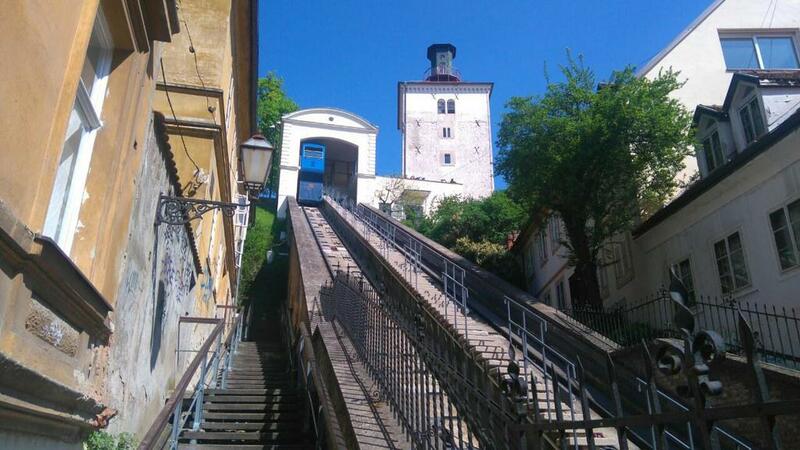 The shortest cable car in the world, the Zagreb funicular is an absolute delight to see. For over 120 years it has been transporting the citizens of Zagreb and its guests between the Upper and Lower Towns. The lower station is located on Tomićeva Street, while the other station is located at the base of Lotrščak Tower. Take a ride! A ten minute ride north of the city centre (or a 30-minute walk through leafy streets) takes you to one of the most beautiful cemeteries in Europe. The majestic arcade, topped by a string of cupolas, looks like a fortress from the outside, but feels calm and graceful on the inside. Enjoy the peace there. Situated below the hillside settlements of Kaptol and Gradec, here you’ll meet Zagreb’s main square. It was designated as a place where fairs could be held. Most of the buildings around the square date from the 19th century, a variety of architectural styles, from Biedermaier to Art Nouveau and Post-modernism. In 1848 the square was officially renamed in honour of Ban (“Governor”) Josip Jelačić. 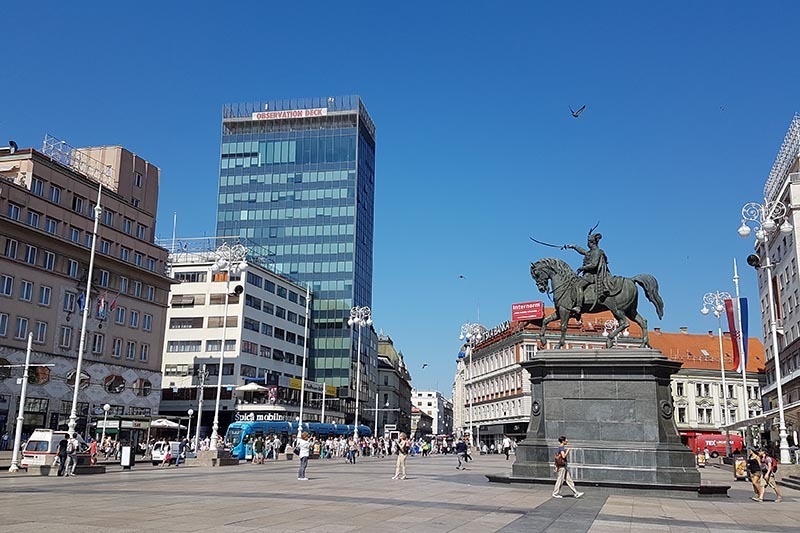 Ban Jelačić Square stands at the centre of Zagreb’s social life and the most popular meeting points are “under the clock” on the west side of the square, and “under the horse’s tail” – a reference to the equestrian statue of Ban Jelačić in the square’s centre. The Manduševac fountain was built above a natural spring that provided Zagreb with drinking water right up until the end of the 19th century. Court records about the persecution of witches mention the spring as their main meeting point. The mystery-laden Grič Tunnel that connects Mesnička and Radićeva streets opened to the public in the summer of 2016. 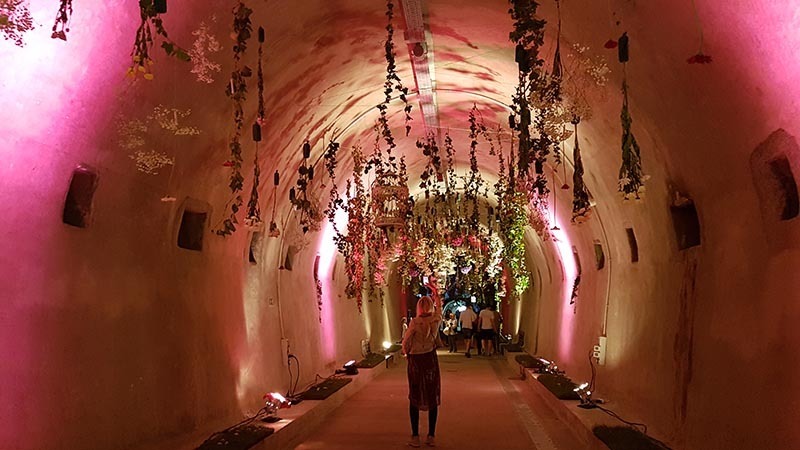 Built in 1943 for use as a WWII air-raid shelter and rarely used since (except for the legendary rave party that took place here in 1993), this 350m-long tunnel is now yours to cross! Officially called Trg Nikole Šubića Zrinskog but lovingly known as Zrinjevac, this verdant square is a major hang-out during sunshiny weekends and hosts pop-up cafe stalls during the summer months. It’s also a venue for many festivals and events, most centred in the music pavilion that dates from 1891. If you need a change from museums and galleries, take a break in this lovely retreat in the very centre of the city. Laid out in 1890, the garden has 10,000 species of plants and plenty of restful corners and paths. Activate all your scents there! Make sure you take a peek at the Stone Gate, the eastern gate to medieval Gradec Town, which is now a shrine. According to legend, a great fire in 1731 destroyed every part of the wooden gate except for the painting of the Virgin and Child (by an unknown 17th-century artist). People believe that the painting possesses miraculous powers and come regularly to pray, light candles and leave flowers. Square stone slabs are engraved with thanks and praise to the Virgin. Maksimir is not just our running home but also a place full of history. 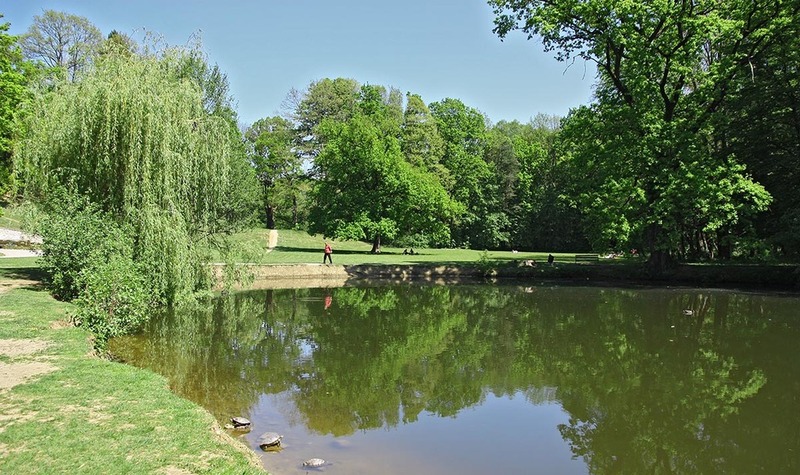 Park-Forest Maksimir was opened in 1794. and was actually the first public park in South-Eastern Europe. 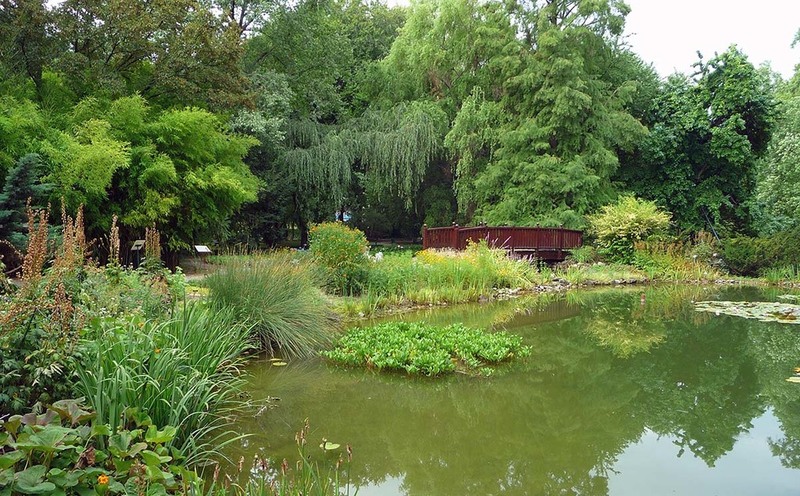 We invite you to discover the green heart of Zagreb. Previous Post Where to sleep in Zagreb? Next Post Get inspired on what to do in Zagreb?